I always thought of seaweed as something only used in Japanese cuisine; however, after a study of Irish foods, I realize it has a long tradition of use in some recipes. 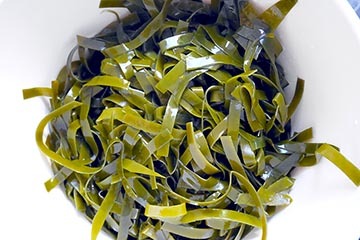 Darina Allen says: “...seaweeds are an entire world of undiscovered knowledge for many people although they have been part of the diet of coastal peoples since time immemorial....In our family, the babies are weaned onto carrageen moss (a type of seaweed) pudding” (The Forgotten Skills of Cooking, page 65). I never knew about this aspect of Irish food history until recently, and the more I learn, the more fascinated I am. Despite my foray at the beach that you see in the pictures, I chose to purchase my seaweed at a local health food store to ensure freshness/safety, and to be certain I knew the variety. I plan on taking a seaweed walk in Ireland to improve my knowledge of the varieties, of course (see below for seaweed walk companies). At a local health food store, I was lucky to find raw kelp that was already cut into noodles (Ocean Approved is the brand name). The kelp I purchased was green and simply seaweed cut into noodle shapes. There are clear “kelp noodles” found in most health food stores or Asian markets; however, these are not raw. 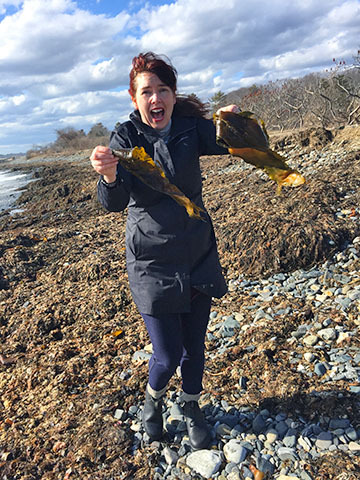 I wanted as close an experience to raw seaweed, and I found it with the Ocean Approved Kelp! Below I have listed where you can purchase kelp and Irish sea spaghetti, which Clodagh McKenna uses in her Vegetable and Seaweed Salad. Her dish simply inspired mine, so I have not tasted the sea spaghetti; however, the kelp worked delightfully! I am sure the Irish sea spaghetti will also. If using Irish sea spaghetti (see below for availability): rehydrate the sea spaghetti and rinse -according to the package- then put in boiling water for about five minutes. I cooled them before tossing with the other ingredients. 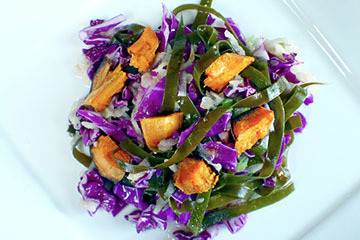 If using RAW kelp noodle cut (harder to find- but my local health food store had them. Again, they are green, not clear like the popular kelp noodles you find- so look for raw): defrost if frozen, overnight in the fridge. Rinse thoroughly. You can eat them raw or throw them in boiling water for about a minute, which I did. Chop half a head of red cabbage into bite size shred-like pieces- then rinse and pat dry with paper towels. Finally, peel and grate the apple. Do this step after all the other ingredients are ready since apple tends to brown quickly. Toss everything, from kelp noodles to apple (except the sweet potato), with the salad dressing. Divide onto plates and place the sweet potatoes on top of each plate of salad. And dig in! Tentatively identified as the Alaria variety by the folks from Atlantic Irish Seaweed!